I could probably spend hours just zooming in and out of Planetary Annihilation's forested planets. Space! Ground. Space! Ground. Spaaaace! 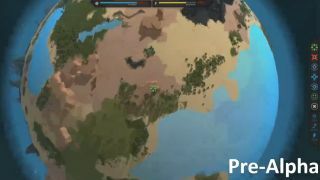 Until I can—the "end of May," if Uber Entertainment hits the alpha release goal it sets at the end of this video—we can all see the scale of the Kickstarted RTS in today's archived livestream , in which Uber's Steve Thompson and Jon Mavor walk us through pre-alpha gameplay. It's not far from the gameplay visualization the former Supreme Commander and Total Annihilation developers showed off during the Kickstarter . It's a little blockier and less complex, but crisp and charming—better-looking, I think. Uber also shows off an impressive replay system, which allows players to rewind to the beginning of the game—while the match is still live—and watch past events. That and more is revealed in the 20 minute stream, and there's more information in our announcement preview . If you want access to the alpha but didn't contribute to the Kickstarter, it doesn't come cheap—the minimum pre-order tier required for alpha access is the $90 Galactic Edition.